Photo: Bruce Holcombe and Gary Holcombe came out on top with 16.98 pounds. TRIMBLE – After three years in operation, the Smith Lake Park Bass Fest has established consistency in participants with over 200 boats taking to the lake Saturday morning, despite fog in some locations and challenging conditions for the more than 400 anglers, with a $10,000 grand prize hanging in the balance. When the weigh-in closed at 5:15 p.m., Bruce Holcombe and Gary Holcombe had a double-double. The two collected the most weight with five bass totaling 16.98 pounds. They also had the biggest fish, bringing it in live, weighing 5.59 pounds. The Holcombes edged out Jesse Wiggins and Jordan Wiggins, who claimed second with 15.56 total. For much of the afternoon, Justin Defoe and Zared Mayfield were in the lead with 15.55 pounds. But the Holcombes took the top spot and the Wiggins duo edged in for second place. The husband-wife team of Spencer and Diane Lynn had a respectable showing with fourth place at 14.78 pounds from five bass. A parent-child combo of Jamie Butler and Clay Butler got the fifth spot, bringing in 14.76 pounds. Second place through fifth was extremely tight, especially with the prize money being distributed by the Cullman County Parks and Recreation Department, the sponsor of the event. Rounding out the top 10 were Chad Smith and Mike Smith in sixth place at 14.40, Lamar Smith and Greg Roberts seventh with 13.74, Robin Erb and Keith Townel and Benjie and Jonathan Seaborn tied for eighth at 13.37 with Michael Harbison and James Bagwell in 10th place, collecting 13.03 pounds on five bass. 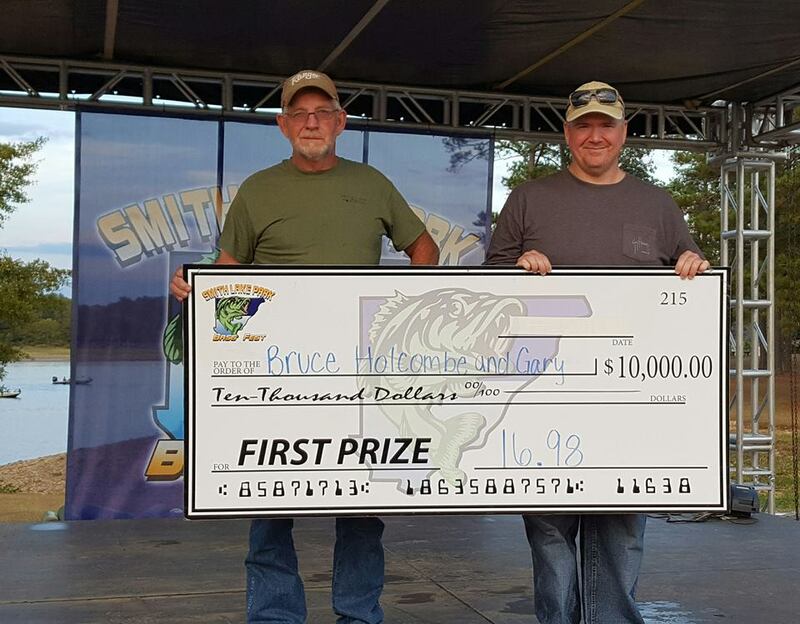 The Holcombes’ biggest bass outweighed the one brought in by Leon Brewington and Randy Brewington, which weighed 5.33 pounds and Roger Shiflett and Dale Carver's 5.15 pounder. The Brewingtons grabbed the individual lead from Shifflet and Carver who were in front for much of the weigh-in until the late afternoon. From the collegiate division, Logan Shaddix and Ethan Flack had the most bass with 9.41 pounds and were 31st overall. Miles Smith and Spencer Smith took in second at 8.86,39th overall, followed by Brett Webster and Evan Horne with 6.60 and a 66th place finish. Those were the only three individual bass that weighed better than five pounds of 453 that were weighed in between 3 p.m. and 5:15 p.m. The total weight of fish brought in live was 802.54 pounds. Ninety-nine boats of the 204 turned in their fish. The Smith Lake Bass Fest started back in 2014 when a suggestion was made to Cullman County Commission Chairman Kenneth Walker. Walker contacted County Parks and Rec Director Doug Davenport, and the rest is history. The festival gathered better than 200 boats and had better weather conditions this time in comparison 2015, when the event took place in the rain. The park is looking for the event to maintain its consistency and to increase the number of anglers and boats. Another event in Guntersville on Saturday kept it slightly down from the 248 that came to Smith Lake last year. Anglers from around the area and other locations came to Smith Lake for Bass Fest, which is coordinated by Fishlife from the Warrior area, who handled the scoring and weigh-ins.